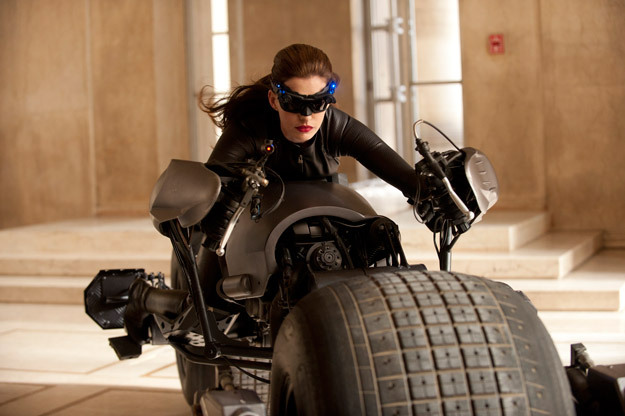 It’s Anne Hathaway’s “Catwoman” from Dark Knight Rises ! Just one day after Warner Bros. revealed the very first picture of Henry Cavill as Superman in Zack Snyder’s Man of Steel, they’ve given us another treat with the first official photo of Anne Hathaway as Selina Kyle from Christopher Nolan’s The Dark Knight Rises. Yesterday, a number of less official photos leaked from the set in Pittsburgh, so Warner Bros. proactively made sure that a better official picture of Hathaway’s character turned up unannounced on the official site TheDarkKnightRises.com, and it looks like the spandex-clad thief has stolen Batman’s Batpod! Mind you, the site clearly refers to her as “Selina Kyle” rather than directly as “Catwoman,” which may be somewhat telling that like “Harvey Two-Face,” Nolan is going for a more realistic approach to the character. The Dark Knight Rises is scheduled to open on July 20, 2012.